As we look back at another year of political and civil unrest, migration and acts of kindness, we remind ourselves of the importance of film to mobilise and inspire us, to reveal incredible stories and journeys behind the great moments in our history and our present. This year’s series focuses on this often arduous journey of overcoming difficulty through art, solidarity and storytelling. Nothing illustrates this balancing act better than our opening film, Even When I Fall, through the visual power of the circus, to give a unique perspective into the way survivors of child trafficking reach new heights and a brighter future through reclaiming their past and transforming it into art. Each film takes us on a journey, from a struggling football team made entirely of immigrants to a daring and independent group of young women learning to become mechanics. From the imaginary world of children refugees to the memory of a home in Palestine. From a normal life as a Jewish doctor to witnessing the terrifying downfall of society. From a focus on individual dreams of making it into a new country to the responsibility of helping others. This year’s programme also takes us on a journey across continents, in Europe, Nepal, the Amazonian forest, to Burkina Faso, over borders, seas and histories. This series showcases moments in history as warning signs for our present, sometimes escaping reality altogether by diving into imaginary worlds and universal stories of friendship, solidarity, love. As usual, we bring a variety of film forms and styles, from collaborative filmmaking to animation, from documentary essay to ethnographic film. These unique perspectives will be, we hope, sources for inspiration, curiosity and change. Last but not least, we want to highlight the voices and creativity of women, both in front and behind the camera, which is why half of our feature films are made by female directors. 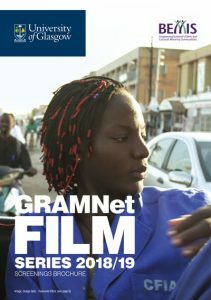 GRAMNet/BEMIS Film Series continues to be a space for showcasing emerging talent from all over the world and for broadening our views and experience of cinema. GRAMNet is very grateful for the generous support we receive from our partners, sponsors, distributors and directors so that we can keep our film series free and open to all. Developing this work with the Equality and Diversity Unit and our long-standing partners in the film series BEMIS, together with their focus on the Year of Young People. This year we extend our partnership to include the UNESCO Chair for Refugee Integration through Languages and Arts and the Confucius Institute, University of Glasgow. Sponsored by GRAMNet, BEMIS Scotland and the Iona Community, with the support of the The Confucius Institute, UNESCO Chair – RILA and the Equality and Diversity Unit at the University of Glasgow.